Spring is in the air, and we’ve got tons of new features to share! This latest LibGuides mini-update is a prelude to the larger style refresh happening this summer. But don’t let the “mini” fool you – this update is only mini in relation to what comes next! Read on to learn all about the new stuff. Table of Contents box type – Are your patrons overlooking the tabs in your guides? Now it’s super easy to create alternate guide navigation menus. Our newest box type automatically displays a list of all the pages in a guide. The menu works in both desktop and mobile view – and better yet, it self-updates every time you add/delete/reorder/rename a page! Select System Content Box -> Guide Table of Contents to try it out, or check out the help guide. All Links Report – Tired of creating link hit reports one link at a time? Us too! We’ve added a new “All Links” report to help make pulling reports on your links a little easier. Head to Statistics -> Links; click All Links (top left corner) to check out the new report. Add custom metadata tags & add them to the source code of your public guides (great for improving webcrawler search rankings). Use metadata tags for internal notes. Tag guides based on any criteria you choose, then use the new Metadata filter on the Guide Index to limit the list to just those guides. Summon Discipline Integration (Summon Clients only) – Improve the relevancy of “Suggested LibGuides” returned in discipline scoped searches! Head to Edit Guide Info -> Subject Categories to assign specific disciplines to each of your guides. Guide Index Updates – Clicking the headers in the Guide Index will now sort the list both forwards AND backwards. RSS & Podcast Feeds – We’ve condensed these 2 boxes into one “RSS” box type – cause why have two boxes when one will do?! Feedback Box Improvements – We’ve increased the character limit in the email address fields – now you can add more email addresses to receive notifications of new submissions. Click Feedback Box Options to edit the list. New Language Support – We’ve added native support for both Serbian and Chinese. Increased Password Security – We’re requiring stronger passwords to help keep your account secure. Removed “Change Box Type” – This feature caused lots of confusion, so we removed it. Hey, My Admin Pages Look Different – Where’s My Banner? When you log in to LibGuides after this update, you’ll notice your site’s banner and footer aren’t showing. Here’s why: we regularly receive questions and problem reports from clients asking why particular admin pages and editing functions don’t work, and the culprit always boils down to one thing – a conflict between a site’s custom code and our admin screens. To help alleviate these issues and the frustration they cause, we’re no longer displaying Custom JS/CSS, Header & Footer Code on the admin side of your system. Now, your system functions will always work regardless of the level of customization in your system. Your patrons won’t notice anything different. The public side of your site remains unchanged, and your guides will look the same in edit mode. Admins who still want to see a banner image on admin pages can head to Admin Stuff -> Look and Feel -> Admin Banner to define a new banner image just for the admin side. This change only impacts admin pages like the Dashboard, Stats pages, System Settings, Look & Feel, etc. Admin Bonus Round: Have you ever forgotten to close a style tag in your site-wide Custom JS/CSS? C’mon, admit it, you have, and is that blank white page scary or what?! Thanks to this change, forgetting to close a tag won’t lock you out of the site editing functions – pretty cool! You asked for it – we’ve made it possible! Do you need to change room booking info for your patrons? Maybe you need to update the information they entered in the room booking form, or change the time they’ve booked. Well now you can! Head to the Room Availability tab; click on any Confirmed room booking, and edit away. Need to apply the same availability to more than one room? You can clone room availabilities too, that’s right, CLONE! 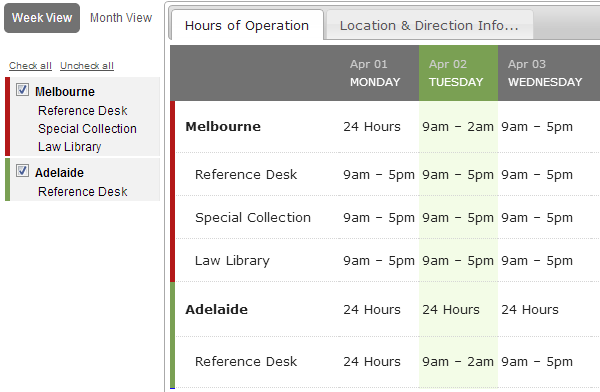 Head to the Room Availability tab and click Clone Existing Schedule to copy availablity from one room to another. Announcing the newest Springshare product – LibStapler is here! The next major innovation from your friends at Springshare is here! We’re moving into the physical realm and introducing LibStapler – the stapler that not only staples, but provides all the great features, statistics, and support you expect from a Springshare product. SMS Alerts – Whether its low staple alerts, breakdown notices, or just to say “Hi!”, LibStapler updates you in real time via SMS. Advanced Diagnostics – Breakdown got you down? Our advanced diagnostics will tell you exactly where that rogue staple is jammed, and the ideal extraction method. Beautiful Statistics – Get up-to-the-minute reports on staple usage, total stapler uptime, unique users stapling, etc. Built in Video Monitoring – Catch that person trying to staple 20 pages in the act! Plus, our proprietary facial recognition software identifies repeat offenders in advance, stopping problem behaviors before the start. Card Swipe Integration – make sure every last staple is paid for. RFID – get rid of annoying chains and strings with integrated RFID and hand-held geolocators. Keypad – ensure responsible staple users thanks to full LDAP integration. For ordering information and client testimonials, check out http://libstapler.com!